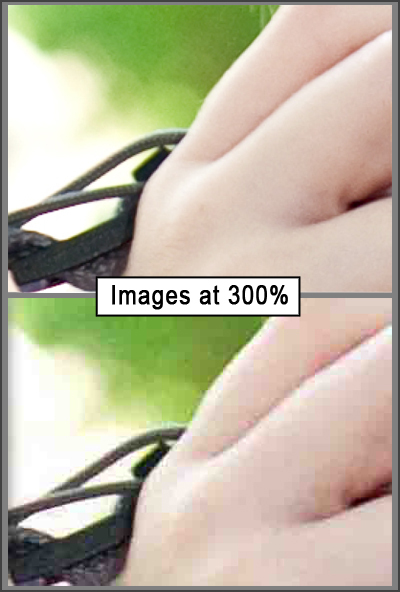 In the example photo above, the top image is a cropped-in area zoomed to 300% showing little or no signs of artifacting, whereas the bottom image shows the same area with visible artifacting. – Shooting your images in JPEG, especially at a very low-quality JPEG. – Saving and re-saving JPEG images during the editing process. – Saving your JPEG images at a low-quality setting in Photoshop. – Over-editing your images (applying too many filters, adjustments, or pushing those adjustments too far). – If possible ALWAYS shoot in RAW. I’m sure that there are many photographers who have a lot of success shooting in JPEG, and I’m not doubting that you can successfully run a photography business and get great images without using RAW. However if your goal is to have the best pixel quality in your images, along with the ability to non-destructively edit your images, you are more likely to have a better chance of achieving that by shooting your photos in RAW. – Edit in .psd or .tif. Part of my workflow is to edit my images in .psd and save the final product as a JPEG … think of the JPEG as a print and my .psd file as my negative. You can edit, save, re-edit and re-save a .psd or .tif over and over without degrading the file. Because JPEGs are considered “lossy” files they will become compressed and re-compressed and lose image data, resulting in poor image quality. It’s also important to save your images at the maximum quality setting in Photoshop, level 12. – Find alternate ways to sharpen. I never use the unsharp mask. Ever. When overdone the effects of the unsharp mask are harsh and can attribute to unwanted artifacts. If I want to add any sharpening to my images I always use the high-pass filter method (here is a video tutorial on how to achieve this effect.) Again, the un-sharp mask is not going to kill or destroy your image, it’s just my personal preference to avoid it. On a side note, pushing any editing to the extreme, whether you are working off of a RAW or JPEG, can be destructive to the overall quality of your photo. – Get it right “in-camera”. Never underestimate the power of proper exposure. It can sometimes be easy to say “I’ll fix it in Photoshop”, but you will really be just adding time to your editing process and will come out with a better image in the long-run. Take a few extra minutes to fix your lighting or correct your settings and, trust me, you will thank yourself during the editing process and your image will be much cleaner and, most-likely, artifact free.